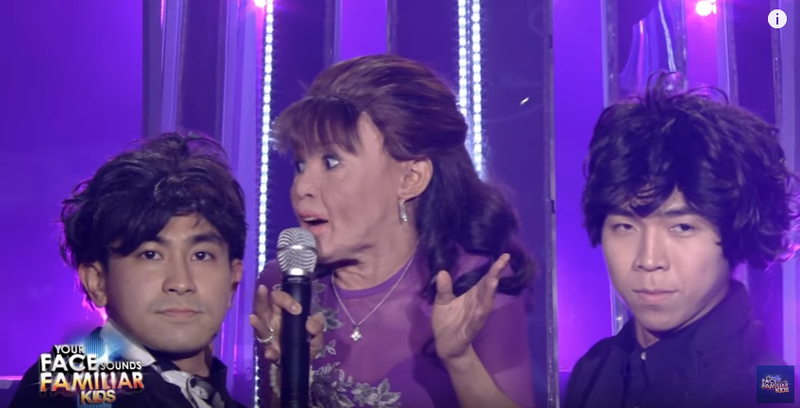 Awra Briguela as Mommy Dionisia Pacquiao drew lots of laughs last night during the pilot episode of Your Face Sounds Familiar Kids. The breakout child star from the #1 soap "Ang Probinsyano" did a fantastic impersonation of Mommy D's "Wrecking Ball" performance during one episode of Gandang Gabi Vice back in 2014. Awra's impersonation of Mommy D was sooo convincing and sooo much fun. Watch it, if you haven't yet. The video above of Awra's performance on YFSF Kids quickly garnered tons of hits after it was uploaded on Youtube, and has now over a million views in less than 24 hours, right before the 2nd episode of YFSF Kids Sunday night, where he topped the scoreboard and was named the first weekly winner. Next week, Awra will do Daniel Padilla. I'm sure this kid will deliver once again.